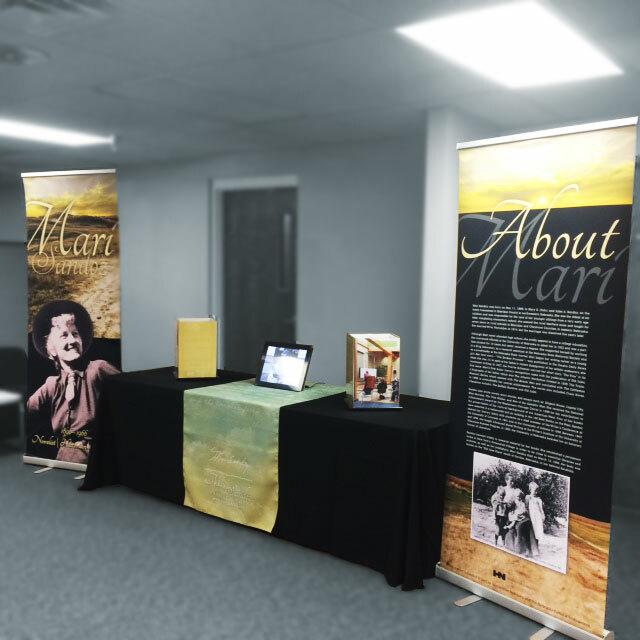 Thanks to a grant from Humanities Nebraska, the Mari Sandoz Heritage Society has a traveling exhibit that is available to libraries, schools, historical societies and museums throughout the state on a first come, first serve basis. It can be used as part of an existing exhibit or for a special event. If you are interested in reserving use of the exhibit, please complete the application form (see link below). The exhibit is comprised of (2) two pull up floor banners, (1) one table covering with runner, (2) two 16” tall spinners, (1) digital photo frame, and several pieces of literature that people can take. If you have questions about the exhibit, please contact us.